I know there are so many great articles about this already, but I wanted to show you how I do my cleanup anyway. I get so many questions about how I paint my nails, I always end up searching for articles to refer to. I figured it would be nice to have a reference of my own! There isn't much to it really, so I'll try to keep this post short and simple. Well, here goes.. So, you painted your nails in the best way you possibly could and everything went pretty wel. But it still doesn't look perfect. Yet! You can leave it like this, or if you're a perfectionist freak like me, you'll try to fix this. 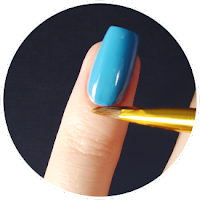 There are several methods to smoothen out the cuticle line, like using corrector pens or q-tips drowned in nail polish remover. Experience has taught me that the method I'm about to show you works best for me! It's really simple, quick and you'll only need two products. First thing you'll need is a brush. It's really up to you what kind of you brush you'll use, but using a medium, not too stiff brush is something I would recommend. You might have to try different kinds to figure out what works best for you. Found the perfect brush? You might want to consider getting backups. The brush will show signs of wear and tear after a while, so you'll need to replace it eventually. The brush I'm using is a paint brush, so it doesn't have to be a fancy make up brush at all! What you'll also need is something to remove nail polish with. Pure acetone is hands down the easiest and fastest solution! However, normal nail polish remover will work too. Recently I switched back to using nail polish remover, since pure acetone can be very drying. It made my hands look super wrinkly. I wish I was an expert on this topic, but you might want to look up the negative side effects Acetone can have, before you decide to use it. Ok, let's do this! Take your brush and dip it in the Acetone. Make sure you don't have too much on your brush by dapping it on a cotton pad first. If there's too much Acetone the polish will flow into the edges of your cuticles and we really don't want that to happen. Now, place the brush next to the nail polish line you want to neaten. Sweep your brush lightly, without applying any pressure (Geez I feel like Bob Ross now). You'll only have to take away a slither. Dap your brush on your cotton pad every now and then, because the nail polish will build up in it. You can also use your brush to get rid of any nail polish that has landed on your skin. Tadaaa: a pretty smooth line near the cuticle. And it wasn't that difficult at all. It usually takes me about 5 minutes to do clean up, but I always try to apply my nail polish as neat as possible. If your application is a bit messy, clean up will take longer. There are some things to pay attention to though. Some colors just won't allow you to use clean up. I find that blues, reds and vampies are difficult colors as they tend to flood your cuticles, especially if they're jellies! Also, you don't want to use clean up on wet nails, I normally wait a good ten minutes before I start. When everything is done, it's time for some rehydration! Cuticles really despise Acetone so it's necessary to use a moisturizer on them, every time after they've been exposed to this hazardous stuff. Until recently I used different kinds of cuticle oils and balms, but I think I may have found my Holy Grail cuticle treatment: Lemony Flutter by Lush. Rubbing this lovely lemon scented butter into your cuticles will really help them remain soft and hydrated. The nail polish I'm wearing in these photos is Feeling Blue by Models Own. This was it for today, I hope you find this helpful! Take care and till next time, xo.